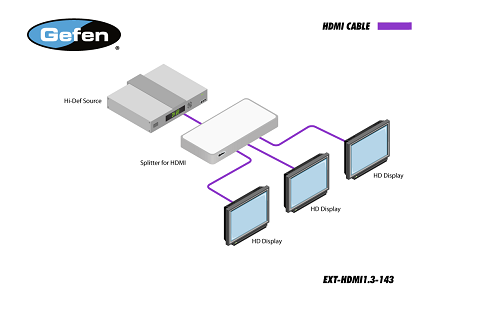 The Gefen 1:3 Splitter for HDMI 1.3 allows AV sources such as Blu-ray players and set-top boxes to be displayed on up to 3 High Definition Displays simultaneously. Two or more splitters may be connected together to create a larger distribution. This product supports HDMI 1.3 Deep Color and 1080p Full HD with 8 channels of multichannel digital audio for superior quality HDMI 1.3 signal distribution. EDID Management for rapid integration of sources and display devices.